Sales training – Is it driving up the use of tablets? Interesting new Internet Trends report from KCPB by Mary Meeker. 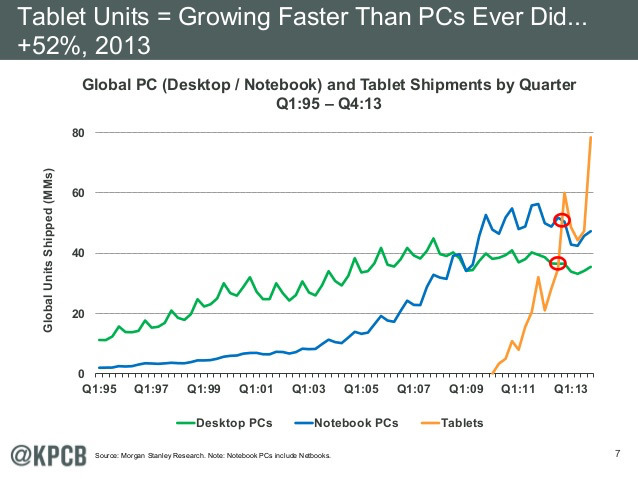 The report shows that tablets are on a growth trajectory faster than PC’s and Laptop’s. 52% growth in 2013. There are many reasons for the growth but clearly tablets are emerging as the tool of choice for sales. A mobile workforce needs the appropriate mobile device. The Smartphone is more prevalent but the relative small screen size makes it often unsuitable as a sales training solution. Exciting new uses of video technology, like two-way asynchronous video streaming for training and coaching application are moving companies to the larger screen size of the tablet for sales training.